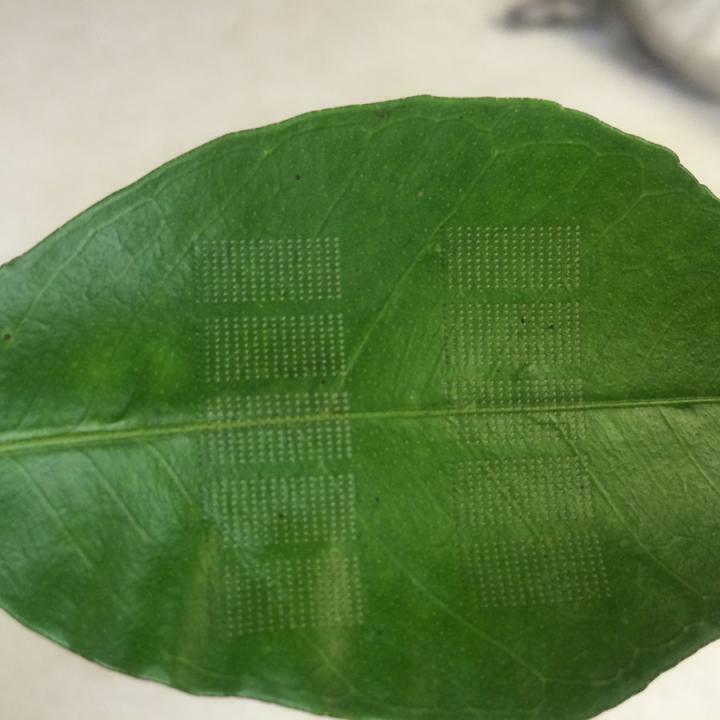 IMAGE: A citrus leaf was lasered with dot matrix perforation pattern to increase penetration of antibiotics. Florida's citrus industry has been struggling for nearly a decade with citrus greening, also known as Huanglongbing (HLB), a disease caused by a bacterium that destroys fruit production and eventually kills the tree. An effective cure has eluded researchers so far, and crop production is declining steadily. A group of researchers from the University of Florida have taken a new approach to the disease by studying a unique application of lasers on citrus leaves. They have found that lasers, when used with the right settings, could greatly improve the success of antibiotic treatments currently being looked into as a way to stop the deadliest plant disease in Florida's history. The full study is available in the January issue of Applications in Plant Sciences. The bacterium starves trees by attacking the vascular tissue responsible for transporting sugars to developing roots and fruits. Bitter, green, inedible fruits result, and once they appear it is only a matter of time before the tree dies. The search for a cure is costing the citrus industry millions in losses. The susceptible vascular tissue, called the phloem, is the innermost layer of bark. While the disease kills trees from the inside out, scientists are trying to fight it from the outside in. "Effective treatment of this disease has largely been limited by the inability to deliver antibacterial substances to the phloem," explains Ed Etxeberria, a plant physiology professor at The University of Florida's Citrus Research and Education Center. "Penetration of externally applied substances into trees is generally prevented by the presence of protective layers on leaves." Lasers piqued Etxeberria's interest around ten years ago, when he began to help develop laser etching as an ecofriendly, paper-free way to label fruit. Knowing what lasers could do, Etxeberria was drawn to their potential to save infected trees by getting antibiotics into direct contact with infected tissue. "At the moment, there are no effective citrus greening treatments in Florida and worldwide. The use of antibiotics is challenged by the inability to effectively introduce such substances into the phloem," explains Etxeberria. "We found that the use of laser light technology significantly enhanced the penetration of foliar-applied substances across the cuticle of citrus leaves, into the phloem and throughout the tree." The laser beam creates microscopic indentations of approximately 250 μm in diameter. Depending on exposure, the indentation can be as little as a single cell layer deep. The researchers tested two-year-old 'Valencia' orange trees grown in large pots in a greenhouse. They applied test solutions immediately after laser treating the leaves, and examined how far the solutions traveled within each plant using specific fluorescent dyes. Applications of oils on leaf tissue after laser exposure prevented damage. "For large-scale field applications, a scaled-up and more flexible model of the instrument containing multiple nozzles for the laser light, antimicrobial spray, and wax application is being developed. The overall system offers the added advantage of lower application frequencies and hence reduction in chemical use, a condition that lessens environmental impact," explains Etxeberria. The laser perforation method can also be applied to other research initiatives, such as in studying the velocity of phloem sap flow and for the delivery of other agrochemicals such as fertilizers, systemic fungicides, and insecticides. Ed Etxeberria, Pedro Gonzalez, Ana Fanton Borges, and Craig Brodersen. 2016. The use of laser light to enhance the uptake of foliar-applied substances into citrus (Citrus sinensis) leaves. Applications in Plant Sciences 4(1): 1500106. doi:10.3732/apps.1500106.